Palomar Medical’s intense pulsed light systems (IPL) are designed to effectively address the signs of aging by treating wrinkles and provides long-term results. Traditional CO2 laser resurfacing treatments are painful and like cosmetic surgery also result in quite a bit of patient downtime. Fractional ablative laser treatments are effective in treating eye wrinkles (periorbital) and wrinkle around the mouth and lips (perioral). Palomar’s IPL systems provide fractional ablative wrinkle treatment through pulses of laser light that penetrates the patient’s skin and generating new collagen production. In one quick and easy treatment session, patients will see dramatic results with fine lines around their eyes and mouth disappearing. Palomar offers two handpiece options for effective wrinkle reduction treatments. For the StarLux 500 system, the Lux2940 is the handpiece option for fractional ablative treatments. 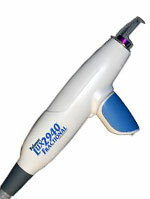 The 2940 Fractional Laser handpiece is the option that works with Palomar’s Icon system.